Autumn is practically here, but that doesn’t mean we have to let go of our summertime bronze! 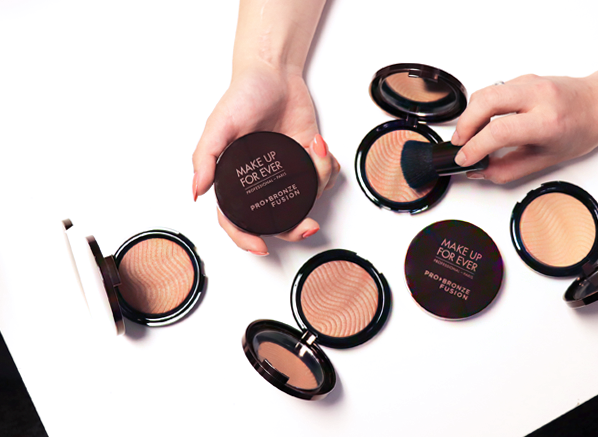 Perfect for all seasons, the MAKE UP FOR EVER Pro Bronze Fusion powders are all about achieving a healthy glow. Waterproof and long-lasting, this unique gel-powder bronzer is designed to never look streaky or obvious, which is ideal for getting ready in the darker morning light. Comprised of an array of matte and iridescent finishes to sculpt or add radiance to your skin, each Pro Bronze Fusion Powder shade is completely fool-proof. 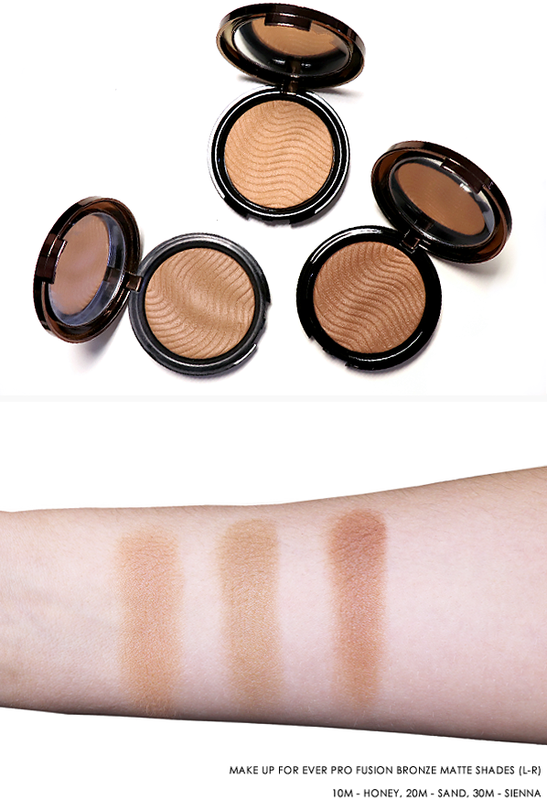 This clever bronzing powder uses its texture to enhance your complexion without a powdery, OTT finish. Sounds pretty good, right? If you’re looking for a contouring bronzer: Choose an M shade, and if you’re looking for a glowing bronzer: Opt for an I shade. However, I understand that the bronzing rule of thumb is different for everyone’s tastes and preferences. Ideal for adding structure to your features, M is for matte. This collection of sculpting shades are more suited to those who want to add depth and shade to their look, you won’t find any shimmer here. 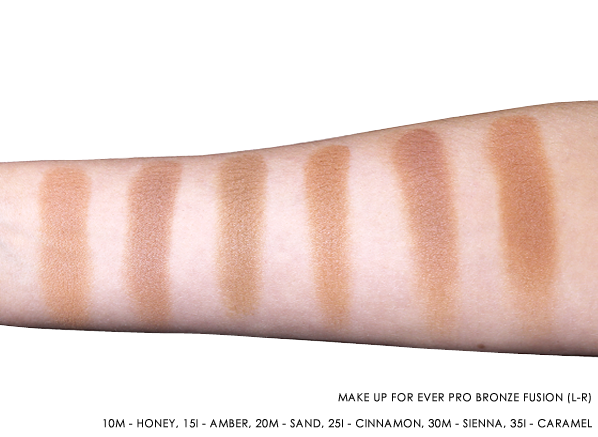 Suitable for even the fairest of skin types, there’s an M shade available for everyone. If you want to use the M shades to contour, opt for a hue that’s two shades darker than your complexion for added definition. The plus side about sculpting with these shades is their ability to build and blend. 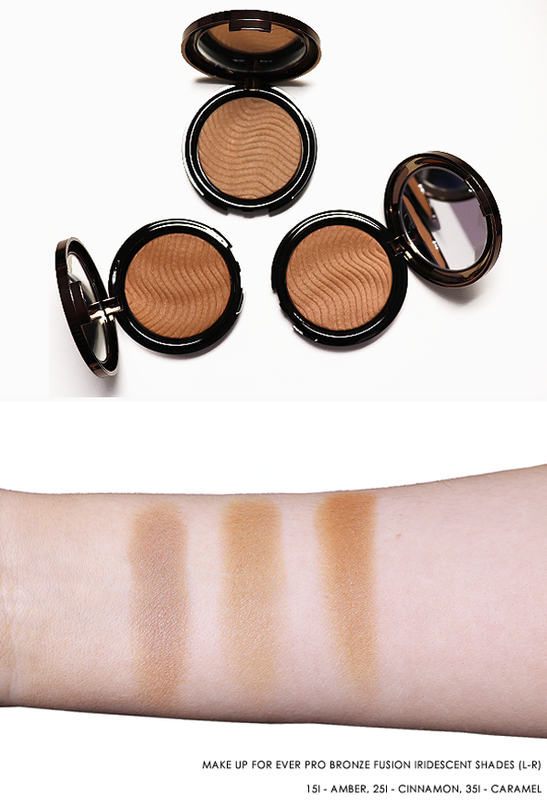 10M – Honey subtly warms fair skin with its ever so slight apricot bronze shade. 20M – Sand is fitted with more of a cool undertone which will sculpt a fair-to-light medium skin tone. 30M – Sienna is the deepest of the matte shades; a medium-to-darker skin will benefit more from its natural warmth. Not found the shade you’re looking for above? You can also choose from the MAKE UP FOR EVER Artist Face Color Sculpting Shades for darker colour variations. More of a sheer finish than a shimmer, I is for iridescent. Although some luminous bronzers can appear too ‘glowy’, the I shades within the MAKE UP FOR EVER Pro Bronze Fusion range are more beachy glow than glitter ball. Each shade fits a light-to-medium complexion perfectly, as their seamless texture blends beautifully into your skin without any traces. Technically, you should apply a shimmering bronzer to the high points of your face (wherever the sun hits your complexion). This is the best way to create effortless radiance, whilst faking the appearance of a post holiday glow. 15I – Amber was made to add radiance to a fairer skin. Compared to the other hues, Amber is cooler and will complement paler complexions. 25I – Cinnamon is slightly warmer than the Amber shade, its golden shimmer will enhance lighter skin types with its ambient glow. 35I – Caramel will beautifully bronze a medium skin tone with its natural, sun-kissed warmth. • What Is Ultra HD Powder & Does It Work? This entry was posted on Thursday, September 14th, 2017 at 10:08 am and is filed under Brand Focus, Make-up, Sun and Tanning, Swatches, Tried & Tested. You can follow any responses to this entry through the RSS 2.0 feed. You can skip to the end and leave a response. Pinging is currently not allowed.